It opens with Leroy, a young, wounded, Iraq veteran, waking to a rare moment of clarity, his senses flooded with the beauty of remembering who he is but the pain of realizing it won't last. When his attempt to end his half-life fails (and man that was some attempt), he is taken to the local hospital where he is looked after by a nurse called Pauline, and visited by Freddie, the night-watchman from his group home for disabled men. 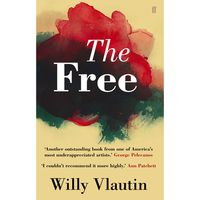 Evoking a world which is still trying to come to terms with the legacy of a forgotten war, populated by those who struggle to pay for basic health care, Vlautin also captures how it is the small acts of kindness which can make a difference between life and death, between imprisonment and liberty. Haunting and essential, The Free is an unforgettable read.